A Gila woodpecker pecks above the entrance to his current nest with an older nest around the corner. I couldn’t tell if he was grabbing an insect or if he was doing some home improvement. I haven’t posted much lately as I’ve been busy doing home work of my own, we’ve started looking for a house in earnest and I’ve been doing a lot of research on our various options. We’ve narrowed the search down to our two favorites and I think we’ll make an offer on one of them tomorrow. One of the two is a bit further from work than I’d like but it is only about 10 to 15 minutes away from several of my favorite hiking locations, including Brown’s Ranch where I took this picture back in April. 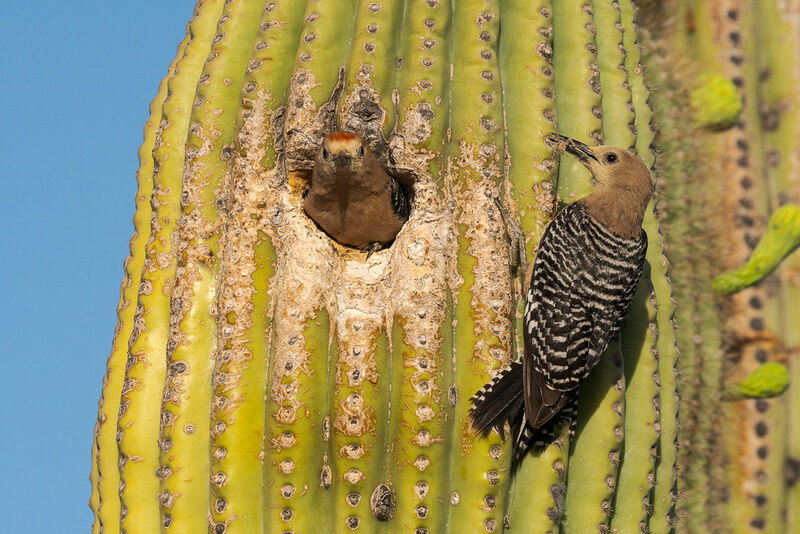 A male Gila woodpecker prepares to leave the nest as his partner brings a spider for their hungry children inside the saguaro. 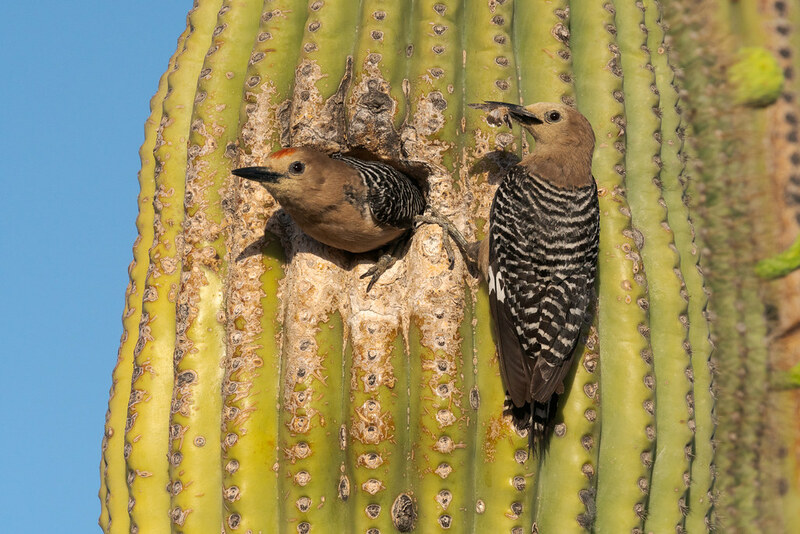 Both parents excavate the nest cavity, the cactus will slowly harden the inside to prevent water loss and it is only then that the woodpeckers can use the cavity as a nest. 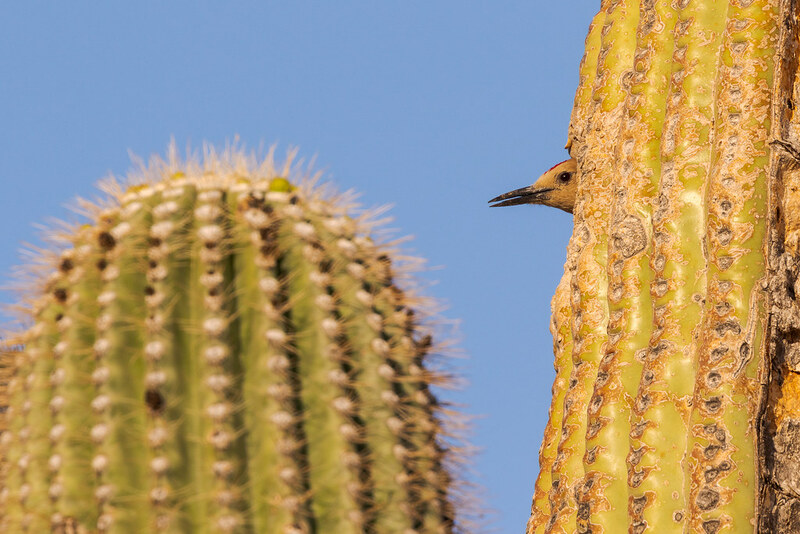 You can see how much of the surrounding surface of the saguaro has been scraped away as they created their home and now land over and over again. It was one year ago today they brought my team in and laid us all off, setting in motion our eventual move from our longtime home in Portland to our new home in Arizona. We’re renting for now but will start looking to buy within a month or two. 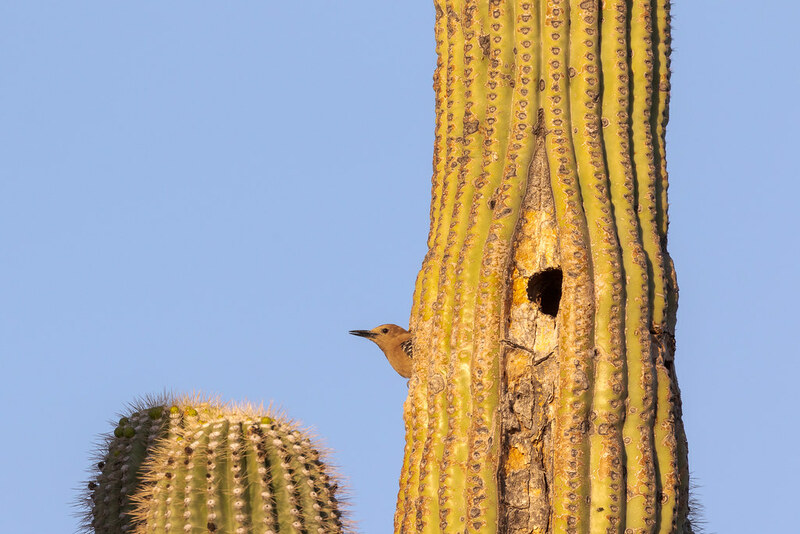 This Gila woodpecker made his new home near the old, moving slightly around the saguaro. Other small birds sometimes use the old nests after the woodpeckers abandon them. Getting to see such new sights has been part of the fun of moving to such a different location. 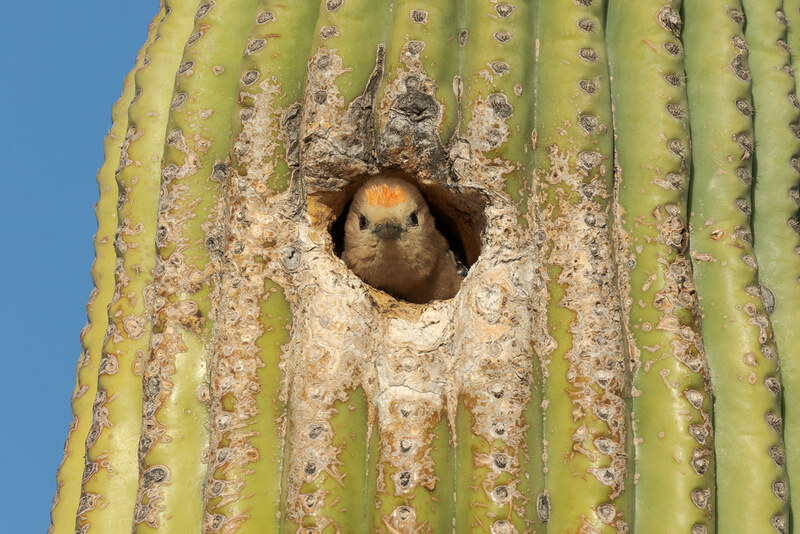 A Gila woodpecker peeks out of his nest in an old saguaro along the Jane Rau Trail in McDowell Sonoran Preserve. Moths For Breakfast Again? That’s It, I’m Leaving! A female Gila woodpecker brings a moth to the nest as the male prepares to leave (the moth was for the hungry babies inside). 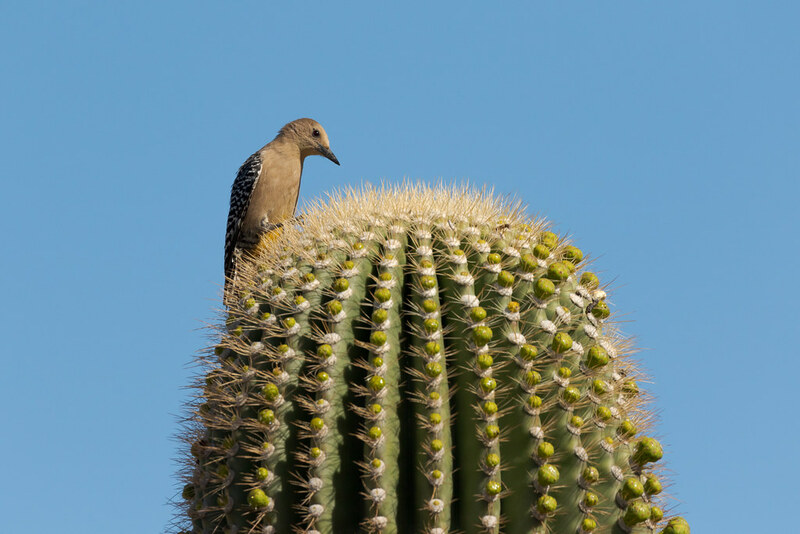 The parents brought a variety of insects (and spiders, as she has in her beak below) to their nest in the old saguaro. The male seemed to spend more time in the nest and the female more time hunting during the mornings I watched them. It required a bit of a hike to get to the nest so I couldn’t get there right at first light but it was a treat to watch them nevertheless. I will always be amazed by the relentless energy parents spend getting their babies past those precarious early days. I also have a 4K clip of them at the nest which I’ll learn to edit at some point and post here. Both pictures are from this spring after we had been in Arizona for about six weeks. 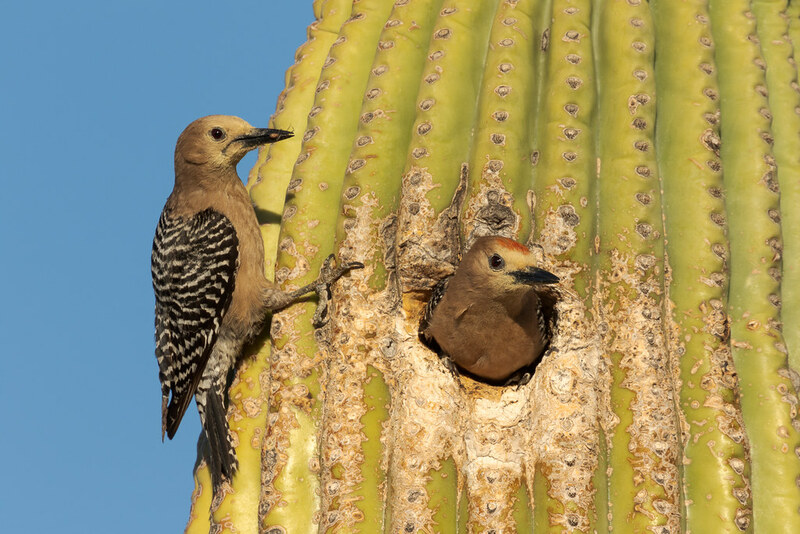 I hoped for this picture since I first learned that woodpeckers like the Gila woodpecker make their nests in cavities they drill into saguaros. 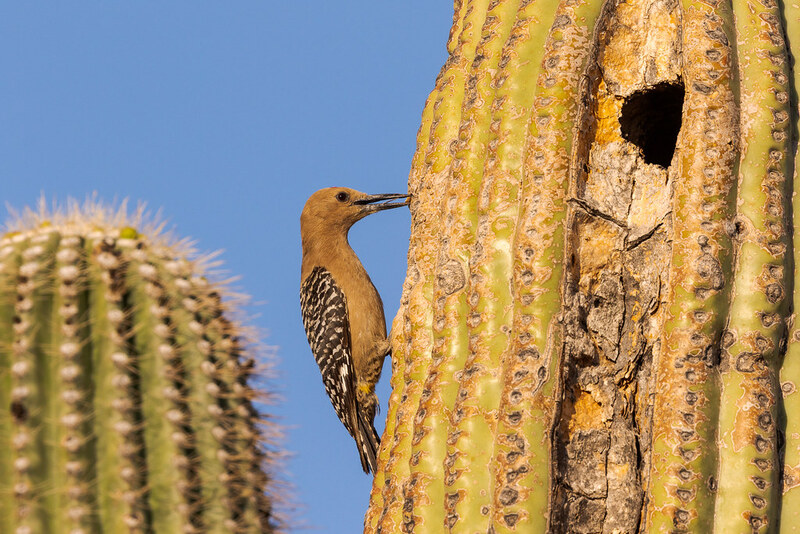 I wasn’t sure how frequent a sight it would be until we moved here and thankfully I had the chance to watch a couple of different Gila woodpecker families this spring. This male and its mate made their hole facing the rising sun but it was a bit too long of a hike to get there right at sunrise. But I spent several early mornings watching in amazement as they brought an endless stream of insects and spiders to the nest. One of the birds I was hoping to see once we moved to Arizona was the Gila woodpecker. It only took a couple of weeks, and my second time hiking, to find one, courtesy of the Gateway Loop Trail at McDowell Sonoran Preserve. My first Gila was a ways off but after finishing the loop I found this female atop a saguaro on the Bajada Nature Trail. I’ve since seen one in our backyard but wasn’t able to get a picture. The Gila is one of 14 new species for me since we moved here a few weeks ago (11 birds, 1 mammal, and 2 lizards).